Heat oven to 400°F. Spray 2 1/2-quart casserole with cooking spray. In 12-inch nonstick skillet, heat olive oil over medium heat. Add onion, garlic, mushrooms and rosemary. Cook 3 to 5 minutes over medium heat, stirring frequently, until mushrooms start to soften. Add rice. Cook 2 minutes, stirring constantly. Add broth and wine; heat to boiling. Remove from heat; pour into casserole. Cover casserole. Bake 15 minutes. Stir in green beans, roasted peppers and 1/2 cup of the cheese. Cover; bake 10 to 15 minutes longer or until liquid is absorbed and rice is tender. Stir in remaining 1/2 cup cheese. 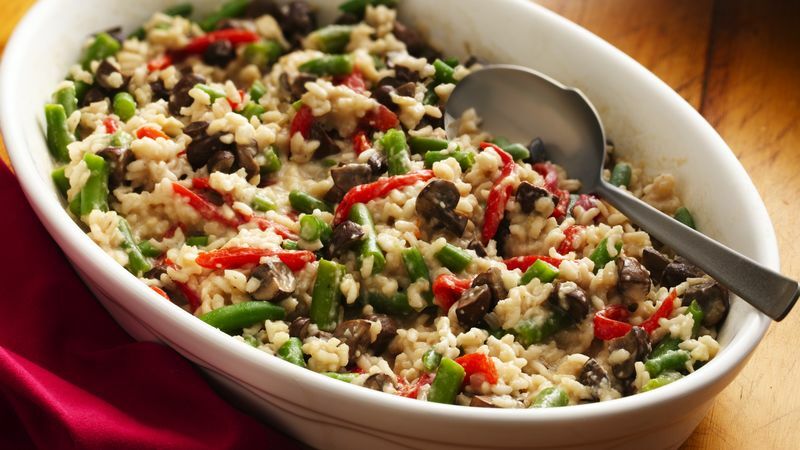 If your family prefers, you could add a cup of chopped cooked ham or chicken to this meatless dish. Add it when you add the rice to the skillet. Crimini mushrooms add a meaty flavor to a meatless main dish. Quartered button mushrooms can be substituted if you prefer.